Lauren Pendo is St. Lukeís School salutatorian. 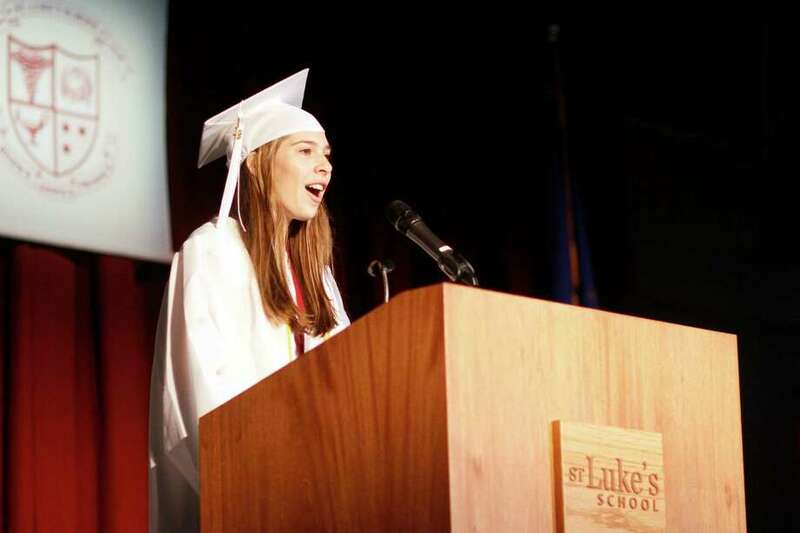 New Canaan, Conn.
Lauren Pendo, of Darien, graduated from St. Luke's School in New Canaan as the Class of 2012 salutatorian. SLS Head of School Mark Davis introduced Lauren as she took the stage to deliver her address. "Though accustomed to achieving the top grades in almost every subject, Lauren eschews academic competition, preferring to help her peers rather than outdo them," he said. "But if you look only at her collaborative nature, you will miss another important side of Lauren, a powerhouse of intellectual curiosity whose penetrating and agile mind will make her a great scientist -- or linguist, or historian, or whatever she puts her mind to if, unexpectedly, chemistry stops feeding her intellect. A role model for her peers and for younger students, Lauren epitomizes the ideal student with a mature balance of intellectual achievement and whimsical fun, qualities that will enrich academics and student life at Davidson College." Pendo told classmates that she has learned to laugh through challenges and embrace "failures" as a chance to learn. She concluded with these remarks: "... it is the moments we least expect, the ones we thought would never amount to anything that turn into the memories we will cherish forever. Although I am sad to leave the Hilltop (SLS) and the familiar faces I have come to know and love, I am comforted by the fact that the times we have spent together, the failures we've survived, and the laughs that we've shared will stick with me forever."